I've always been inspired by the achievable goal of space settlement. I'm excited that my relatively short life-span on Earth just so happens to fall within the window in history where mankind's expansion in the solar system is possible, and I made a decision long ago to do everything in my power, both personally and professionally, to help advance that capability. My career with Masten Space Systems matures the rocket technology necessary to land with pinpoint accuracy at future off-Earth settlements, but my personal research has brought me all the way to Red Planet itself, or at least to a simulated version. 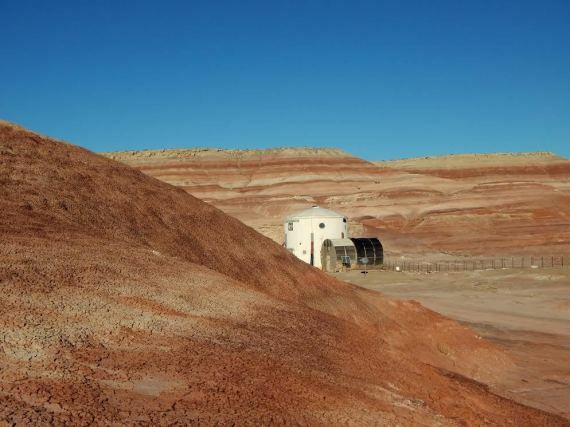 The Mars Desert Research Station (MDRS) is nestled in the dramatic rock formations that comprise Utah's San Rafael Swell, and a generous layer of iron oxide colors the landscape Martian-red. 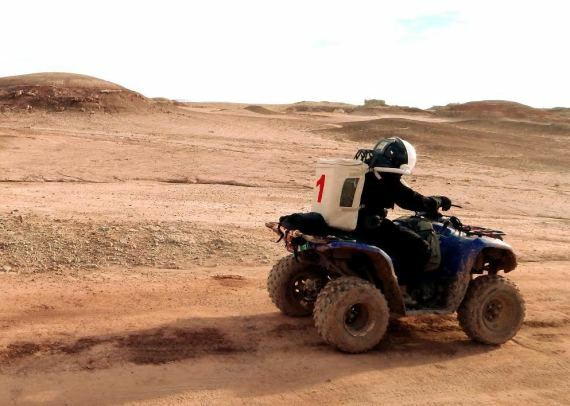 The terrestrial habitat is owned and operated by the Mars Society, and has been utilized by a variety of national space agencies and scientists to simulate analog Martian field research. Most recently, the prototype laboratory has brought together myself, Belgian NASA Ames research Dr. Ann-Sofie Schreurs, Canadian educator Pamela Nicoletatos, American MEDEVAC pilot Ken Sullivan, German trauma surgeon Dr. Elena Miscodan, American lawyer and public official Paul Bakken, and Japanese microbiologist Dr. Takeshi Naganuma. Together, the seven of us are Crew 149, and we have been immersed in a complete spaceflight simulation since the beginning of February, living and working in an analog Martian environment. 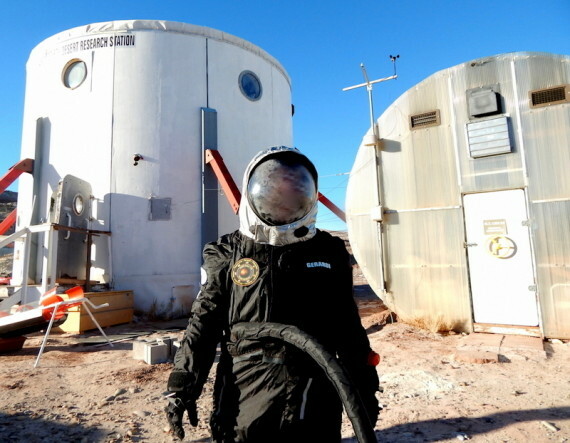 The author in a prototype spacesuit from Final Frontier Design, a commercial company who has a SAA with NASA's Collaborations in Commercial Space Capabilities (CCSC) program. We're completely isolated from Earth except for an opportunistic desert rat who has taken residence somewhere near the kitchen, and an imaginary eighth crew member we've dubbed "Murphy," in honor of all the things that have gone wrong during our rotation. Early on, we experienced a total loss of power, fuel, and communications. The catastrophic loss of our sole toilet, refrigerator, water pump, and link to the outside world kick-started our transition into complete self-reliance. We constructed field latrines, rationed water, and relayed with Mission Control to transform a rover into a temporary generator. And we did it all in spacesuits. Once power was restored, my colleagues back home even amused themselves by emailing me a model for a mousetrap. While it wasn't the first thing I had anticipated manufacturing on Mars, it was a perfect demonstration of the utility 3D printers can have when you're unable to pack every single tool you could conceive of needing for the rest of your life. (L-R) The author Kellie Gerardi, Pamela Nicoletatos and Ann-Sofie Schreurs in the lab. Despite the difficulties of basic survival on Mars, our rotation has been overwhelmingly productive. There's a profound psychological satisfaction in working together in hostile environment. Life with an international crew has also been an incredible and occasionally hilarious experience. In anticipation of a visit from Karl Pilkington and the BBC production team that produced "An Idiot Abroad", my crewmembers were walking around asking "when is the Idiot supposed to arrive?" "Is the Idiot coming today?" We've shared a lot of laughs and a lot of stories. I feel privileged to have spent quality time with a team of such accomplished individuals. An extended EVA with a crew rover. After getting the hang of basic survival in a simulated hostile environment, we turned our attention to research. Under the guidance of Dr. Naganuma, who is responsible not only for the discovery of new species, but for entirely new classes of species, we set out on scientific EVAs to search for lichen colonies in the nearby area and collect samples. Lichens are the most resistant organisms on Earth, and whenever new land or ice sheets form, they are the first settlers. Through the use of a centrifuge in the lab, we separated out the samples, and now we will use a sequencer to identify any extremophiles and cyanobacteria. Some people believe cyanobacteria should be sent to Mars in an early terraforming effort, due to their ability for photosynthesis. But cyanobacteria alone won't be enough. They'll need protection from harmful UV rays and an ability to retain humidity for growth. Our lichen colonies could provide perfectly resilient "housing". As a true bonus, we may have even stumbled upon a new species of bacteria that can aid lichen growth. Time and a sequencer will tell. The author in the analog Martian environment. My 26th birthday also fell during our rotation (13.8 in Martian years) and after a celebratory meal of macaroni and reconstituted-cheese, a true Martian delicacy, my crewmates and I all gathered around the science lab to document the results of our "Proof of Beer" study. In addition to all of our uncontestably academic research, we also brought about 50 pounds of ORBITEC JSC Mars-1A Martian Regolith Simulant, aka NASA-grade Mars dirt. We decided to investigate the viability of sorghum seeds and hops rhizomes in a Mars soil simulant. The academic defense was that sorghum is a grain of high nutritional value with relatively low water needs, and the hops plant is used as a medicinal herb. The real reasoning was that since yeast has already been sent to space, if we prove germination and root establishment of sorghum and hops -- the two other constituent ingredients of beer, we have essentially proved that one can produce beer on Mars. 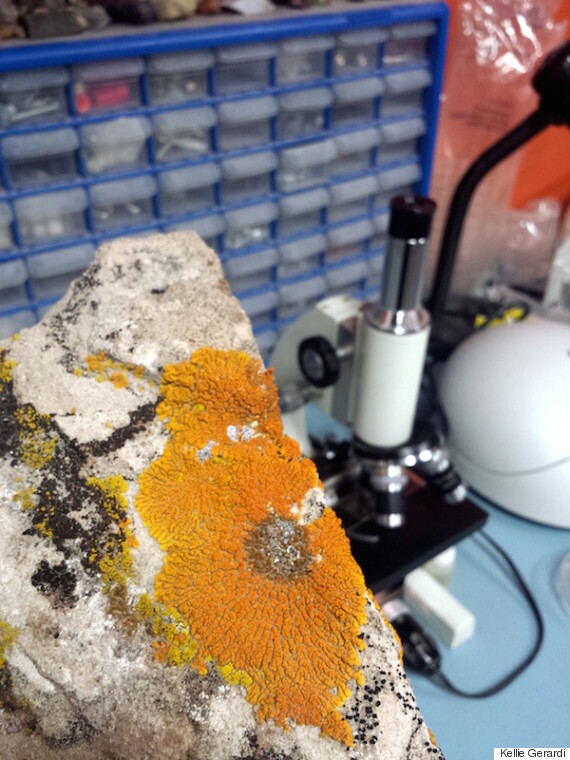 Lichen studies in the lab. 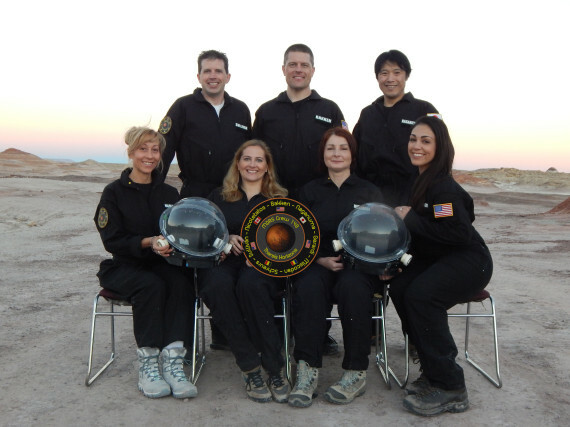 Our experimental group didn't just grow in Martian soil -- they downright thrived. Rosenplantz and Gildenfern, my two favorite pet plants, looked like Jack and the beanstalk. This is particularly exciting, because after the plant growth, the normal home-brewing process can take place, leading to an eventual keg of space beer. While this has been a moment of nerdy glee in an otherwise traditionally academic environment, we never lose sight of why we're all here together, and what goal we're truly working towards. I'm optimistic about the future of our species, but I also recognize that life on Earth has an expiration date. Without space settlement and advanced life support systems, our entire species has an expiration date as well. On a more emotional level, I want humans on Mars simply because it's within our reach; the entire solar system is within our reach. That's the mantra that makes me proud to go to work every morning at Masten Space Systems, knowing that we're maturing the technologies that will unlock access to the unexplored corners of the universe. 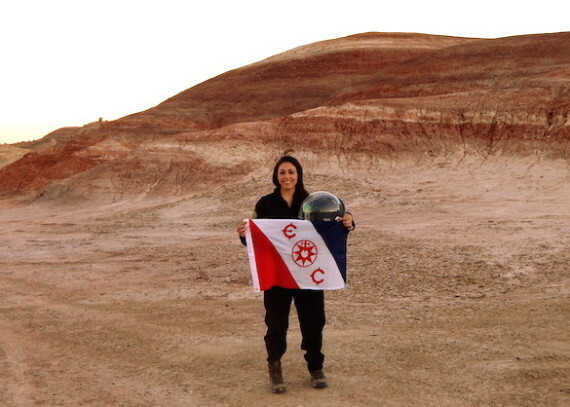 Space settlement is a capability that my entire crew is dedicated to pursuing in our lifetimes. While there are a lot of hurdles associated with colonizing Mars, the ability to have a cold beer might just make the goal a little more appealing.